How to create a ringtone from a favorite song? 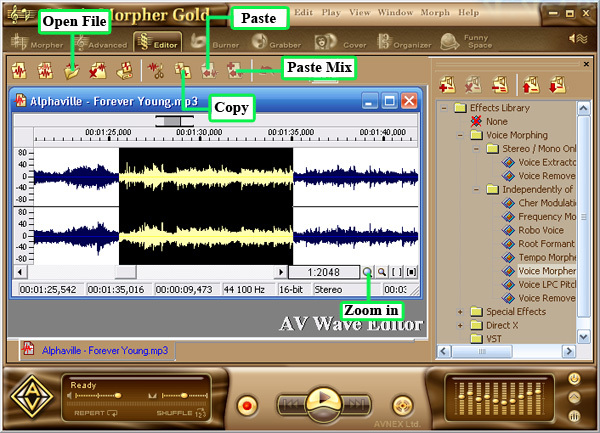 - Open AV Music Morpher Gold and click Editor on the module bar to open AV Wave Editor. - Click the Open File button on the toolbar to import a song into the module. - Play the song by pressing the Play button on the Player panel. - Remember to turn on the Equalizer to enhance the sound of music. You can adjust all bands to your taste or choose an available preset by clicking the Presets button. - Listen to the song carefully, then click and drag the mouse to select a favorite part that you want to create as a ringtone. For a more precise selection, you can press the big lens at the bottom right of the window to zoom in the wave chart. - Click the Copy button on the toolbar (or Ctrl-C). - Press New File on the toolbar to open a new window, then click Paste (or Ctrl-V). - Open the File menu, choose Save As, type a name and select mp3 format for this ringtone file. Note: You may refer to other projects and apply some effects on the file to make it a unique ringtone of your style.